The National Renderers Association defines why the rendering process is an important part of the recycling process and how it effects our environment. “Every year, the North American rendering industry recycles approximately 59 billion pounds of perishable material generated by the livestock and poultry, meat/poultry processing, food processing, supermarket and restaurant industries. The rendering industry turns this material into valuable ingredients for various soaps, paints and varnishes, cosmetics, explosives, toothpaste, pharmaceuticals, leather, textiles and lubricants.” MOPAC provides a similar rendering and animal by-product recycling services to harvest and packing facilities as well as fat and bone removal services to supermarkets. 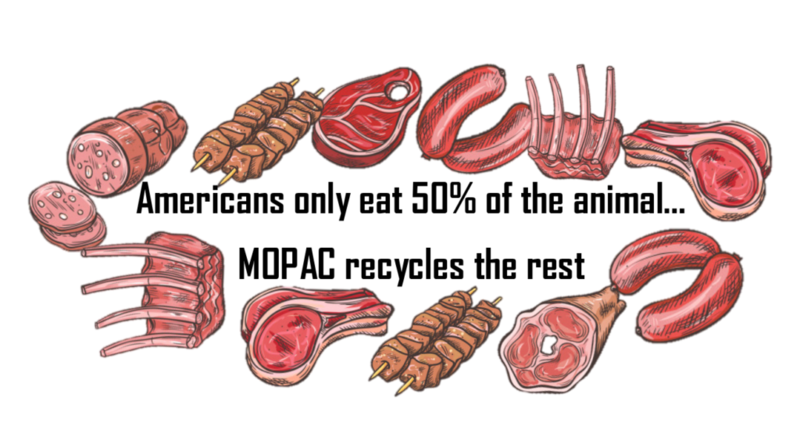 The trim material is a result of the process of preparing product for the meat case for consumers. We also collect case-ready product that has exceeded its shelf life date and is thus ineligible for sale to consumers and must be discarded. Any meat or animal product that cannot be sold or consumed by humans can be recycled at our plant into new materials and given a second life. Rendering these types of inedible products adds value and is a more sustainable and environmentally sound approach than sending waste to a land fill. MOPAC’s services are better for your business, and better for our environment. Find out more about what we do for the environment by going to Our Commitment page. We can provide 44-gallon plastic containers and lids that are used for the collection of animal by-product, like fat and bone and meat scraps. There are poly combo, 2,000 pound capacity bins available as well for high volume locations. MOPAC has partnerships with many local companies that supply wholesale meat to the East Coast. We provide pricing based on the quality and quantity of material, and how far your location is from our processing plant. We work with each location individually to give free quotes about what savings MOPAC could offer your business. For larger facilities that have a lot to process, we have several different solutions that can we can offer, and each can be customized for a business’ needs and requirements. Leave your information below to find out what custom solution MOPAC can provide for your company. We can provide quick and efficient quotes for potential MOPAC service. Just leave your contact information below and what kinds of materials you are dealing with. 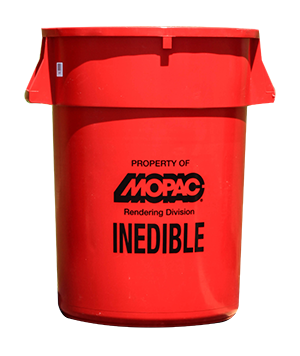 Mopac recycles waste products not suitable for human consumption. We have an extensive network of state-of-the-art trucks to collect and recycle inedible products. These materials arrive at our rendering facility around the clock and are processed as quickly as possible in order to maintain the integrity of the finished product.